The first 2 columns on assisting students with hearing loss in post-secondary places of learning focused primarily on the preparatory work that should be done prior to entering university or college. Specifically, we talked about the need for planning appropriately, taking initiative and maintaining a positive viewpoint. Then in the second article we did a deeper dive into one part of the planning process and that is where to obtain funding for the equipment and services needed for success. This third article will present some case examples of students with hearing loss currently studying in university. We will link in how the 3 pillars for success played a role. First, we should think about the environment in which learning takes place at the post-secondary level. 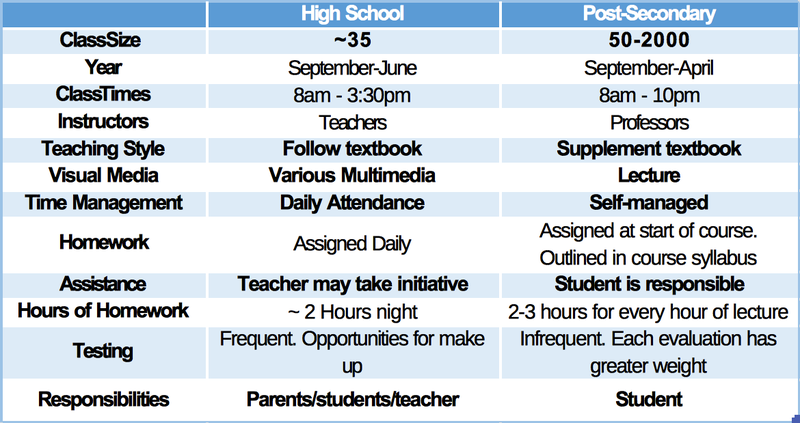 The table below outlines some of the key differences between secondary and post-secondary places of learning. As can be seen, there are significant differences between secondary and post-secondary. Class size is one of the biggest differences. 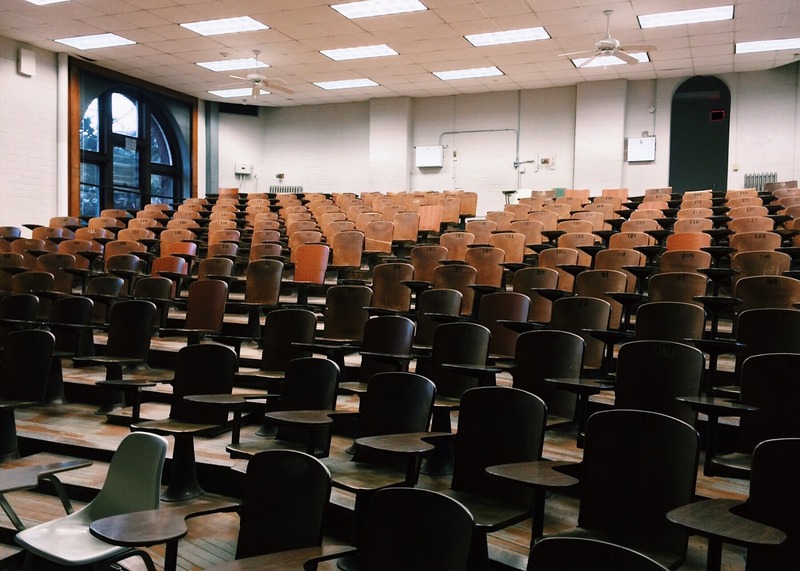 It is not uncommon in post-secondary institutions, particularly at the undergraduate level, to have class sizes of students that number in the hundreds, if not several thousand students. Now think about what the student needs to hear. The professor certainly is one, but also the possibility of multimedia and other questions from the floor. This environment can be classified as far-field speech in the presence noise. Papers shuffling, chairs dragging, coughing, low-quality HVAC systems, other students talking, external noise from the street or hallway, are all examples of noise that with degrade the signal-to-noise ratio (SNR). Therefore, the percentage of students with hearing loss that will need a system of wireless microphones is 100%. It is incumbent upon the audiologist to ensure that their patient with hearing loss attending post-secondary is made fully aware that the hearing aid or cochlear implant will not be sufficient. As indicated before in the first article, I was not counselled about this and subsequently had extreme difficulties in my first year of university. Failure to counsel a secondary student about this is unacceptable. While class size is one of the biggest differences between secondary and post-secondary, other differences exist. Consider the length of day. It is not uncommon for a post-secondary student to have classes starting at 8 am in the morning and extending out to 10 pm at night. Students with hearing loss need to devote more energy listening than do their normal hearing peers. Therefore, listening can be extremely taxing in the evening when one is already tired from a long day of classes. In addition to the differences in class sizes and course time, the content and delivery of teaching is substantively different. While high-school students have the lifeline of PowerPoint presentations and textbooks containing all of the necessary material, university students quickly learn that this is not the case. Lectures use textbooks as a support, it is expected the student has read the textbook before showing up to class and builds from there. Visual media, if present at all, will leave the more nuanced points to be heard and noted by the students. This source of material is where a student is vulnerable. Given that the other sources don’t necessarily overlap, this presents the danger of gaps in their understanding of the subject at hand. The end result is the student will miss crucial information on the first pass and have to work to fill in the blanks on subsequent revision. It is easy to see how this puts them at a clear disadvantage. Finally consider the amount of personal responsibility required from a post-secondary student. An observant secondary school teacher may notice if a student with hearing loss is struggling and may take steps to intervene, or at the very least consult with the student’s assigned Hearing Resource Teacher or Educational Audiologist. This will not happen at the post-secondary level. It is entirely up to the student to seek assistance if they are struggling to keep up. In light of all these considerable differences, the clinical audiologist who has a student transitioning to post-secondary must counsel the student and family about planning for a successful transition. Also, the audiologist must be aware of equipment solutions that are available. The success of these solutions must be monitored on a frequent basis to ensure that the solution chosen is effective. The first case comes from personal experience. In August 2017, I began studies at University of Toronto’s Institute for Health Policy, Management and Evaluation. I began the planning process early, consulted with the accessibility counsellor at the university, and obtained funding for equipment. I elected to use 12 omnidirectional table microphones strategically placed at each table of 4 students, as well as 2 small adaptive directional pen-style microphones to be used by the course professors (several courses had 2 instructors). This original strategy failed due to several factors. First, although I used these table-top omnidirectional microphones successfully before in meetings of around 10 people, a class size of 44 was more challenging as there was more ambient room noise as well as a poor noisy HVAC system at the university. Second, each table of the classroom had 2 large computer monitors on each table as well as the students our personal laptop computers. These acted as acoustical barriers preventing sound from being picked up by the table microphones. Specifically, the high frequencies were being blocked due to the shorter wavelengths. This created difficulty hearing consonants which are critical for speech intelligibility. I now had to consider a different approach that would increase the SNR and the perception of consonants. The best solution for that would be hand-held microphones. I now had a choice between using 14 pen-style microphones or the educational style of microphones used in elementary and secondary schools, However, I was concerned about student compliance with using the microphones. The pen-style microphones would all easily transmit to me, but not to any speaker system while the educational style allows for the addition of a line array speaker. With the added speaker, all students in the class would benefit from the higher SNR particularly due to the poor acoustical environment that the majority of classes were held. As such, I elected to use the educational style in order to provide benefit to all the students in the class which in turn motivated them to comply with using the Passaround microphones. Anecdotally, the other students have commented how much better they are hearing as well compared to the poor-quality system that was already in the room. The second case example involves 2 audiology students with cochlear implants. Once again, all 3 options were presented to these students: pen-style microphones, table-top microphones, and educational style microphones. After trialling the options, the students elected to use 12 pen-style microphones. Two were assigned to each student for their personal use for labs, group work, and social activities. Ten pen-style microphones are used during audiology classes. One or 2 are given to the professors teaching the class, while the remainder remain on the tables and are picked up when a student has a question or comment to make. The compliance with microphone use is reported to be good, which is not surprising given that these are all students in audiology. However, we question the level of compliance with using these pen-style microphones if the students were in a different field of study. A final point to make is that accommodation is equipment to improve comprehension in the classroom is the only strategy for success. For example, when doing group work, it is critical to provide the student with a quiet environment. As such, I have been provided with a key by the university for a quiet break out room to do our group assignments. In summary, we recommend that audiologists become familiar with more than just hearing aid technology as there are many patients, including post-secondary students, who require this in order to succeed at school or work. Moreover, audiologists need to appreciate the complex listening environments students and working adults with hearing loss find themselves. We are the professionals that are supposed to help with improving function, not just testing hearing and fitting hearing aids. Andres Diaz-Valles is the Bilingual Account Coordinator at Phonak Canada.